Baumgardner's model is illustrated in the 27 minute documentary titled: In the Beginning: Catastrophic Plate Tectonics and the Genesis Flood, which was produced in 1996 by Keziah and American Portrait Films. Today it is believed that the earth is made of many "pieces" or "plates". These plates consist of the crust, mantle and core. The crust is the thin rocky outer layer that can be anywhere from 3-45 miles thick. Below the crust is the mantle, it's made of solid rock that is very warm or even hot. This layer is around 1,800 miles deep. Below the mantle is the core, which is made mostly of iron. The outer part of the core is melted. 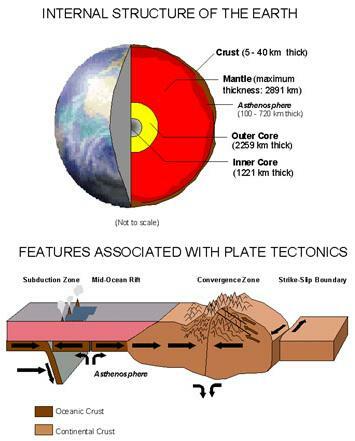 Any theory of plate tectonics is based on three main movements. Extension (moving apart)is compression normally caused by subduction (one plate falling under another), and transform faulting (horizontal slipping along a large fault line). A faultline is a flat surface rock fracture, which shows evidence of relative movement. The Catastrophic Plate Tectonics Theory suggests that some catastrophic event such as the Flood of Noah might have caused a break in the Mid-Atlantic range, which caused magma to flow from the core and the plates to split apart. Today, magma still flows from the Mid-Atlantic range and slowly moves the plates. But the actual splitting of the plates is believed to have happened very rapidly. There is a ring of relatively cool material in the lower mantle that corresponds to past and present subduction zones surrounding a hot zone under the Pacific, and hotter material being squeezed up under Africa as predicted by Catastrophic plate tectonics. A more recent discovery of a slab of oceanic crust in the lower mantle was also predicted by Catastrophic plate tectonics. But still, for about 50 years this thought was neglected due to a small group of seismologists who professed that the strength of the mantle rock was too great to allow continents to drift in the way Wegener had calculated. They estimated the rocks' strength by watching the behavior of seismic waves as they went through the earth. But they were calculating the strength of the rocks at the time of their testing, not from back when the earth was in its pre-flood state. 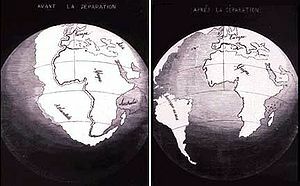 During those 50 years, scientists who believed in the theory of one original supercontinent were considered ignorant people who didn't look at the facts. But today, that view has reversed. Today, most scientists believe in the fact that the earth was once a supercontinent. Now we have more information on our planet due to mapping the ocean floor using sound waves, measuring the magnetic field above the seafloor, timing geomagnetic reversals of the past by unlocking the magnetic memory of the continental rocks, and locating earthquakes with a world-wide network of seismometers. The hydroplate theory is a relatively new model of Earth history put forth by Dr. Walt Brown in his book In the Beginning. It states that before the Global flood a massive amount of water was underneath the crust. The pressure on the water caused the plates to break and separate. The escaping water then flooded the whole earth. Because these plates were broken, moved, and affected by water, (Hydro = water) these plates are considered hydroplates. It is believed that the preflood earth held a mass of water that surrounded the earth underneath the crust. It might have held as much as half of the water in our oceans today. This water was seemingly held in coterminous chambers forming a thin spherical shell. The shell was possibly 10 miles below the earth's surface. Increasing pressure on the water started stretching the crust. This "stretching" created a microscopic crack which violently grew about 3 miles per second. This crack found the weakest parts of the crust and broke through them. This crack encompassed the globe in about two hours. The water was being pressured by 10 miles of rock and exploded out of the crack. This water was shot almost 20 miles into the atmosphere. This created fierce rains and even extreme hail. Some of the water shot high above the stratosphere creating ice crystals that fell in certain areas. These extreme hails buried, asphyxiated, and instantly froze many animals. This includes the frozen mammoths found today. The main problem with this theory is that it generates too much heat, but this can be dealt with by several methods. A rapid expansion of space would remove large amounts of heat. This could be either universal or local. Based on M-theory a super cold extremely near parallel universe could serve as a heat sink. A direct act of God. The waters from the deep may have been freezing cold, which would absorb excess heat. ↑ 3.0 3.1 Earthquakes and Plate Tectonics by the U.S. Geological Survey, Earthquake Hazards Program. In the Beginning: Catastrophic Plate Tectonics and the Genesis Flood 27 minute documentary of Baumgardner's model that may be previewed online. The Geophysics of God: A scientist embraces plate tectonics--and Noah's flood U.S.News & World Report. June 8, 1997. This page was last modified on 10 February 2016, at 18:07.